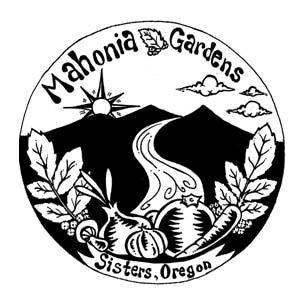 Mahonia Gardens is a one-acre market garden in Sisters, Oregon, dedicated to growing quality produce. We primarily cultivate in 4’-wide intensive, permanent beds resembling the French-Intensive or Bio-Intensive styles of Alan Chadwick or John Jeavons. Given our limited space, we maintain small paths—usually about 1’ wide—to accommodate the greatest amount of cultivated space. Most labor on the farm is done by hand, using broadforks and digging forks to create and maintain beds. While we are not certified organic, we use absolutely no harmful chemicals in our production—no pesticides, herbicides, chemical fertilizers or anything.